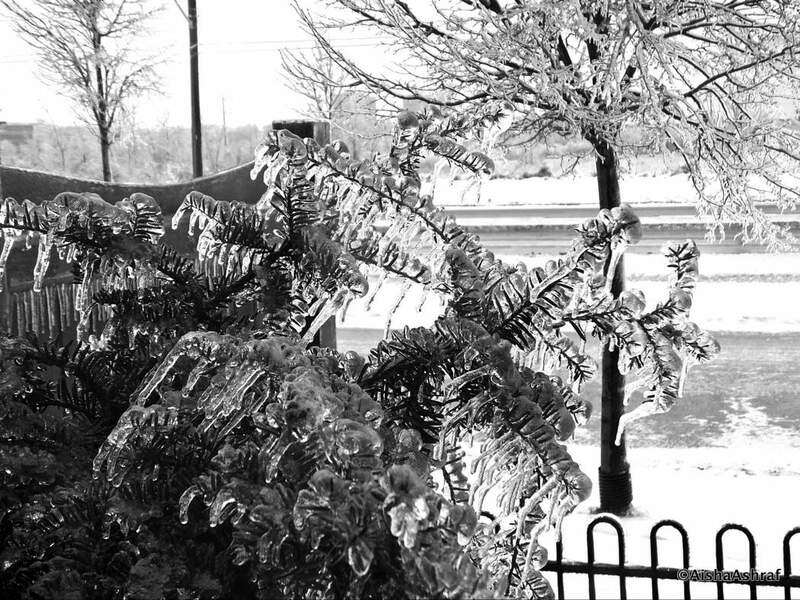 [dropcap]T[/dropcap]his weekend saw Ontario hit by an icestorm of epic proportions. It was something I’d never experienced before and this one was said to be the worst in a decade. Weather warnings had been going out since Thursday as meteorologists tracked two weather fronts destined to clash above our heads. The storm hit here Friday evening with freezing rain swiftly hardening everywhere, crushing every surface in an icy deathgrip. Checking outside before going to bed, I found everything encased in glasslike brittle beauty, right down to the finest twig. Icicles hung everywhere and the world was, quite literally, frozen still. I fell asleep to the sound of ice pellets tapping the window while blue-white flashes from exploding transformers and arcing power lines lit up the sky. In the early hours of the morning the power finally failed. On Saturday we awoke to chaos. Temperatures were still below freezing and a quarter of a million people were without power. The ground was a sheet of ice an inch or more thick – some people even strapped on blades and skated down roads. Although minor roads were lethal the main ones were clear thanks to gritters and snowplows working through the night. Our gas stove meant a warm breakfast wasn’t a problem. Then we headed outside to free the jeep from its frozen casket. It took some effort to break into, encased in a thick layer of solid ice. Once I got the drivers door open I started the engine to slowly warm the windows and begin the melt. Up and down our street neighbours were out trying to break the sheet ice and clear it from driveways and footpaths. We only had a small window to minimise the danger and get salt down before the temperatures plummeted again in the evening; minus ten, but with the windchill closer to minus twenty. After getting the kids into the car through whichever door we could open we headed out. Most of the main roads were passable with just the odd one blocked by downed branches. Everywhere you could see the suffering of the trees. Though they looked beautiful, glittering stiffly in their frozen splendour, the weight of the ice was overbearing – we saw a good number that had just split right down the trunk, like banana peel. Wherever there were trees the ground beneath was littered with their broken limbs. Whenever we drove under larger ones we held our breath lest a branch give under the insufferable weight of the ice and fall on us. The airwaves were filled with warnings about trees bringing power lines down and advising people to treat all downed lines as live, stay well back and call emergency services. Our first stop was for petrol, we were running on the reserve tank. At our nearest gas station we discovered lines of motorists and only one pump working. Driving further we passed more closed pumps as deliveries hadn’t been able to get through. With heavy hearts, we had to make a call – one last try then head back: we couldn’t risk getting stranded in sub-zero temperatures with three kids. Thankfully our last-ditch try was a winner. The pumps were working but people were panic buying, filling jerry cans as though in readiness for armageddon. We filled our tank three-quarters and left them to it, heading uptown to a local grocery store. Everything seemed ok inside but as we walked towards the back of the shop lights were out and staff were covering items in the open chillers with cardboard. A clerk told me they were moving frozen produce outside to a refrigerated truck in the parking lot. There were still folk about, doing their last minute Christmas shopping or picking up salt, and the air seemed laced with adrenaline as people cheerfully met the latest challenge Mother Nature set them. It takes more than this to faze a Canuck. We continued on our way, heading east first to Oshawa where more and more traffic lights were out, leaving motorists to practice their All-Way Stopping skills at multi lane junctions unsupervised. There was some laying on of horns and the odd nut-job who pulled an unexpected U-ey but overall everyone was getting on fine. That errand done, we switched directions, driving west out past Ajax to Pickering. Everywhere the power was out – traffic lights were dark and people were hauling logs off the roads. The landscape was Christmas card beautiful – ghostly white and completely still – and many townships were ghost towns. Your photos are amazing, I feel like i was right there. Even though it was chaos and sad, you really captured the moment well. *sigh* Merry Christmas to you too Emma! Wow it looks so unbelievably beautiful but I am glad it is you and not me. A very merry Christmas to you and yours from the balmy 80 degrees of the Dominican Republic – where the electricity still goes out most days! I remember two previous ice storms where are trees weathered the system fine, though coated in ice. This time we weren’t so lucky. Large branch after large branch started falling around 2 a.m., and continued throughout the day. How on earth the fence did not collapse from the weight of all the branches is beyond me. Our trees will probably have to come down in the spring, or if my husband has it his way, he will create two totem poles! Ooooh totem poles – that’d be interesting! And it goes without saying, photos would be essential! What a challenge! I’m glad you managed to find everything you needed and got home safely. Here in England it’s quite mild but terribly windy at the moment. I think there’ll be some trees blown down tonight. Happy Christmas. Glad u have gas in both house & jeep.